Home Animals Dogs Lone Star ticks and meat allergy: Is there a concern in dogs? Lone-Star-tick-associated meat allergy is an interesting phenomenon in people that is getting a lot of attention, especially as these ticks (like others) are expanding their range. The condition itself is one of those odd-ball quirks of nature that you’d never expect. Because it’s a “foreign” substance to humans, if their immune system encounters it, it may create antibodies against the carbohydrate. This can happen with a Lone Star tick bite, as the body reacts to tick saliva. Although it’s rare, this can lead to allergic reactions when the body encounters alpha-gal again. Since alpha-gal is present in red meat (but not poultry or seafood), ingestion of meat in people with a lot of antibodies against alpha-gal can result in an allergic reaction. This usually occurs 3-8 hours after eating and is often manifested as development of itching, hives, vomiting and diarrhea. Anaphylaxis is possible but uncommon. Lone Star ticks can bite dogs and there’s been some talk about meat allergy as a reason for tick prevention in dogs. But, what’s the story? 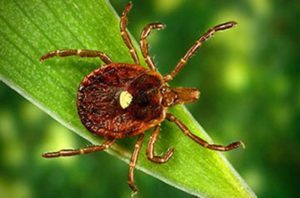 We don’t really know, but I have a hard time seeing any risk of dogs developing meat allergy secondary to Lone Star tick bites. Since dogs are mammals of the non-human/ape/monkey variety, the are already full of alpha-gal. It’s not a good survival technique for a host to create antibodies that attack itself, so a Lone Star tick bite that transferred alpha-gal would just be adding a minute amount to a dog that’s already full of the carbohydrate. There shouldn’t be any risk of antibody development or food allergy. There are a lot of good reasons for tick prevention in dogs, but I can’t see acquired meat allergy being one of them.